Getting the spout of a full gas can in and out of the small fill tank hole is always a challenge, which usually ends up with spilled fuel. We now offers the Hose Bender spout, a utility jug spout which uses the cap and lanyard to create a natural bend to the hose. 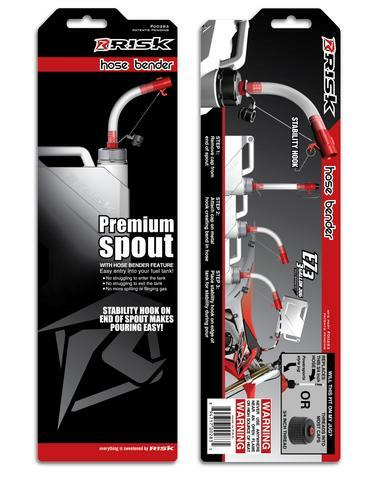 This bend is what makes it easy to place your spout into your gas tank without spilled fuel. It also makes pulling the hose out of the tank easy, reducing spilling and spraying when your tank is full and you need a quick exit. 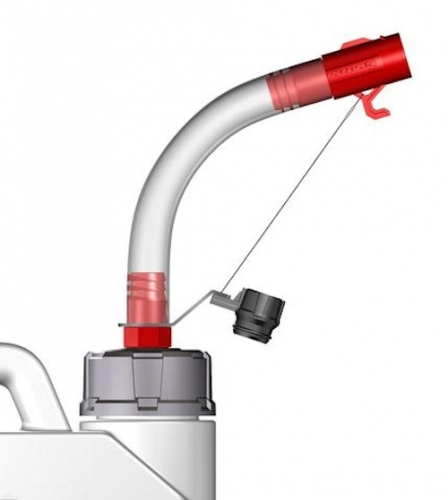 The Hose Bender also helps stabilize your utility jug while pouring. This stability is maintained by a hook located at the end of the Hose Bender spout which rests the lip of the tank being filled. This simple but innovative design feature is a huge asset when filling any tank. Finally, the Hose Bender is constructed from HDPE Plastic ensure it is chemical resistant and durable. Thread this universal spout onto the EZ3 Utility Jug, or any other powersports style utility jug with a 3/4 thread in the top of the cap.